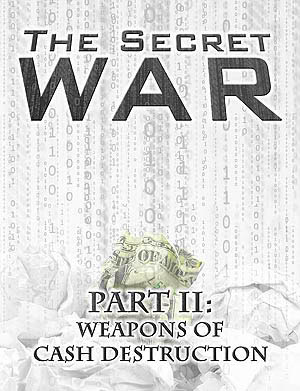 In THE SECRET WAR Part I, authors Craig R. Smith and Dr. Lowell Ponte explained that the “War Against Cash” is being waged because cash has become intolerably dangerous to the giant economic illusion built on debt by the government and the Fed. * In one recent year, police confiscated more than $5 Billion from ordinary citizens. This was more than all the money thieves stole that year! * Today you’re no longer “innocent until proven guilty,” but rather, must now prove your money or property did not come from criminal activity! * Banks still tolerate small amounts of cash and cash-backed debit card transactions, but they would prefer to move solely to “cashlessness”. * The government wants every transaction you make to empower Big Brother. Cashlessness surprisingly gives vast powers to government. Market equities, bonds, mortgages, commercial paper and other wealth based on debt and derivatives add up to roughly $337 Trillion. If even a tiny panic or “run” on the system were to occur, the banks do not have enough cash to cover even 1% of these holdings. The good news is that there’s still time for you to win this secret ‘War Against Cash’ by converting a portion of your debased government money into the secure, private ‘store of value’ money which America’s Framers specified in the U.S. Constitution. Learn how to survive and thrive – despite THE SECRET WAR on cash! FREE White Paper by calling 800-289-2646 or simply register HERE.